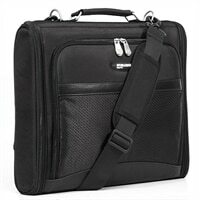 Mobile Edge 2.0 11.6" Express Work-in Notebook Case - BlackWhen you are traveling fast and light, this is the case for you! Designed to carry your computer essentials without any unnecessary added bulk. The unique design lets you work right out of the case, perfect for those quick moments at the airport or between calls. This durable case is made from rugged 1680D ballistic nylon with steel fittings and reinforced rivets. Holds Google Chromebooks, Surface Pro 3, HP Revolve and all laptops up to 11.6"
When you are traveling fast and light, this is the case for you! Designed to carry your computer essentials without any unnecessary added bulk. The unique design lets you work right out of the case, perfect for those quick moments at the airport or between calls. This durable case is made from rugged 1680D ballistic nylon with steel fittings and reinforced rivets.